Whilst we agree generally with (Herefordshire Council Cabinet Member) Cllr Paul Rone’s condemnation of litter louts, it’s a bit more complicated than that, isn’t it? 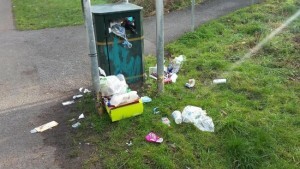 Difficult to dispose of litter when it appears the outsourced contractors haven’t emptied the bins. Perhaps Cllr Rone (Redhill) and other administration members should think about berating our contractors as well as litter louts? Their time (Tory Cabinet members) might be better spent monitoring Balfour Beatty’s performance, making sure bins are empty and offenders are fined, than spending it personally picking up litter for a couple of hours once in a blue moon? Click here to read the full HT Story.